The Station is in the church of St. Pudentiana, daughter of Pudens the senator. This holy virgin of Rome lived in the second century. She was remarkable for her charity, and for the zeal wherewith she sought for and buried the bodies of the martyrs. Her church is built on the very spot where stood the house in which she lived with her father and her sister St. Praxedes. St. Peter the Apostle had honored this house with his presence, during the lifetime of Pudentiana’s grandfather. 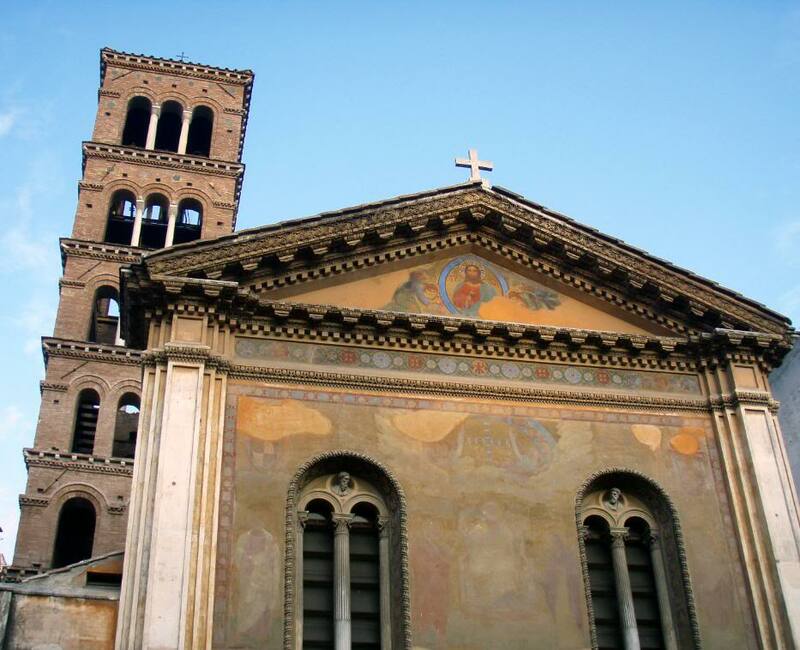 The church is one of the tituli, the first parish churches in Rome. It was known as the Titulus Pudentiana, named after the daughter of the Roman Senator St Pudens. It’s mentioned in the Liber Pontificalis, and a tombstone from 384 refers to a man named Leopardus as lector de Pudentiana, this name refers to St Pudentiana. This latter form is first attested in the 4th century apse mosaic; earlier documents and inscriptions use Pudentiana, who was a daughter of St Pudens and sister of St Praxedes (see Santa Prassede). The first church or chapel on the site may have been established as early as in the pontificate of Pius I (140–155). The first time this interpretation is mentioned in written sources is in a document from 745. The church is built over the house of St Pudens, which after the deaths of Peter and Paul was used as a ‘house church’. Archaeologists have dated the first chapel, built in the bath, to c. 140. This fits with the tradition that claims that the first chapel was built by Pope Pius I. It was converted or rebuilt to a regular church after tolerance was granted to Christians in the early 4th century. Dedicatory inscriptions have been preserved, naming «Illiceus, Leopardus and the Presbyter Maximus» as the persons who financed work in the time of Pope Siricius (384-399). In 1870, when the façade was rebuilt, remains of Roman houses were found beneath the church and neighbouring buildings. It is possible that one of these houses was the original house-church. Among former titulars of the church is Cardinal Luciano Bonaparte, great-nephew of the emperor. The current titular is H.E. Joachim Meisner, Archbishop of Cologne. The church was granted to the Filipino community by the Italian bishops, making it the national church of the Philippines. The Philippines has the largest Catholic population in Asia. It is served by diocesan clergy. After the close of the eighth century, a story arose of Saints Pudentiana and Praxedes, in which they were described as sisters (Pudentiana being only 16 years old) and the daughters of Pudens, martyred by Nero, and granddaughters of the Senator Quintus Cornelius Pudens, the host of St. Peter. (Opinion is divided as to whether this Pudens is to be identified with the Pudens mentioned in 2 Tim 4:21.) The sisters are said to have buried Neronian martyrs in a well, now enclosed within this church. When Paschal I (817-882) began to translate relics from the catacombs, these two sisters stand together first in the list of virgins transferred. Though the story of the sisters is somewhat uncertain, it is certain that there was a Christian named Pudens in whose bathhouse Pius I (141-155) later built an oratory, which was rebuilt in the fourth century and constitutes one of the original twenty-five parish churches (tituli) of Rome, known as the ecclesia Pudentiana or titulus Pudentis. Owing to a confusion in the name, the church later became associated not with Pudens, but with Pudentiana; indeed, the name was even misunderstood to be Potentiana! The old basilica was modernized in 1598 by Volterra, and the façade was restored and Via Urbana staircase added in the 19th century. The house of Pudens, or possibly the baths adjoining the house, has been partially excavated under the church. Note the 12th century campanile, 19th century façade mosaics, and the magnificent 4th century apse mosaic, thoroughly Roman in inspiration and unique in its treatment of Christ-Jupiter and the Apostles-Senators against a Roman panorama. The buildings in the background may be the churches built by Emperor Constantine in Jerusalem, suggested by the gemmed cross with which Constantine is said to have marked Calvary. The panorama is intended to symbolize the Heavenly Jerusalem toward which we are on pilgrimage. Next to the cross are symbols of the Evangelists, the oldest preserved example of these famous icons. Unfortunately the 16th century “renovations” partially destroyed this mosaic, probably the oldest in Rome. The sisters’ well stands in the left aisle, which is said to contain the relics of 3,000 early martyrs, and behind it opens the Capella Caetani (family of Boniface VIII), built in the 16th century. Notice here the mosaics over the entrance, an Olivieri relief over the altar, and the columns of Lumachella (fossilized snails) marble. At the head of the left aisle is Cardinal Wiseman’s Chapel of St. Peter, with an ancient pavement, della Porta’s fine relief of the conferral of the Keys, and a slice of Peter’s altar table (the rest is embedded in the papal altar of St. John Lateran). A door in the left aisle opens into a cortile with a small chapel frescoed in the 11th century. The station was formally erected by Gregory the Great. Among the former titulars of the church is Cardinal Luciano Bonaparte, great-nephew of the French emperor. Today it is the national church of the Philippines, which has the largest Catholic population in Asia. Location: Near S. Maria Maggiore, on the Via Urbana, just off the Via Agostino Depretis.